On Saturday morning it was rainy and stormy, so I decided to fill the house with baking smells by giving Lolo's Perfect Cinnamon Buns a go. 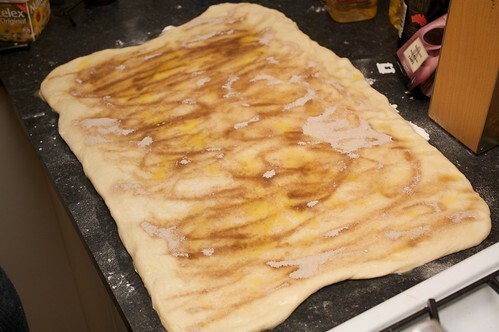 I really enjoyed the process, the dough was quite lovely to knead and I liked sprinkling the cinnamon and sugar across the open dough. My dough was spread a little unevenly, which really showed when I rolled it - it was spread a little bit too thin across the middle, and a little too thick along the edges. I was concerned, after rolling and leaving them to the second rising, when they didn't appear to have risen, but they actually rose to the point of smushing together during baking, which was unexpected. I was unhappy with the marg + sugar combination across the bottom of the tray, I will definitely not be repeating that one. It was just too much Nuttelex. Next time I think just some baking paper to prevent the buns from sticking will do. 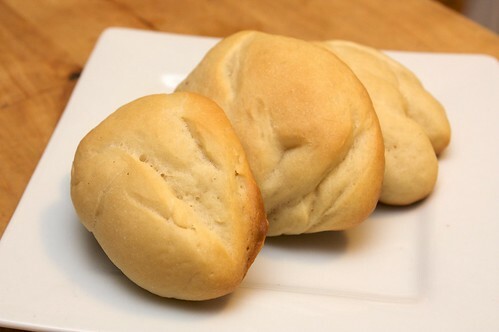 Also after they cooled, the buns were very yeasty, so I'd like to cut down the amount of yeast a little bit. 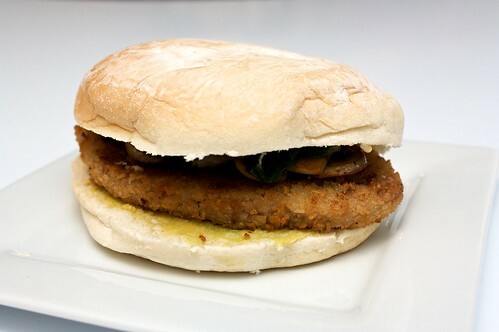 I missed the usual sultanas in the buns - I'm so used to eating them, but I didn't even think to add them when I saw they were missing from the recipe, and the buns really could have used that extra sweetness. Overall verdict: okay recipe, not too difficult, but needs some slight modification to really be perfect for me. 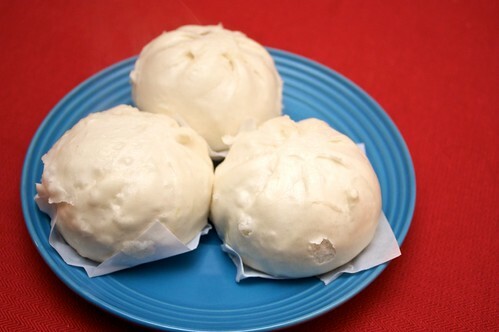 Quick mid-afternoon snack, Green Farm char siu bao. Left to defrost for a bit, then ten minutes in the bamboo steamer. One day I'll try making my own! One of the things I really love about the office environment is the way people bring things in to share. About this time of year there's always a bag of oranges or lemons sitting on a table in the lunchroom, sometimes accompanied by a little smiley-face note. I had a little bit of passionfruit pulp in the fridge, from a previous experiment, and thought I'd better use it up so on Sunday night I baked some lemon and passionfruit cupcakes, with lemon icing, for at-work snacking. 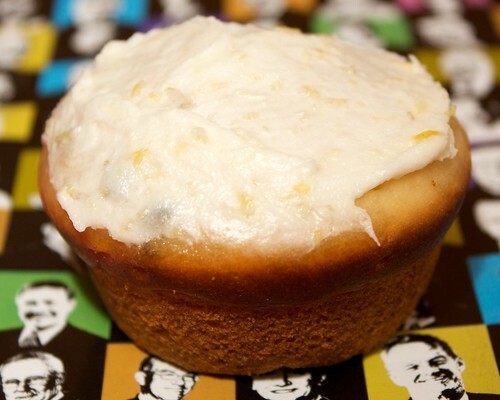 This is a modification on my lemon and poppyseed cupcakes. Sift together flour and baking powder, then stir through the sugar and vanilla essence. Mix in the nuttelex, applesauce, and soymilk, until well-combined. Stir in the lemon rind, lemon juice, and passionfruit pulp, and mix through. Divide into 12 cupcakes and bake 180C for 20 minutes. And the icing: one heaped tablespoon of nuttelex, a squeeze of lemon juice, a tablespoon of lemon rind, and start mixing, adding icing sugar until you've got enough icing. Wait until the cupcakes are cool, then ice. It's really cold, do you know what I need a lot of? Curry! 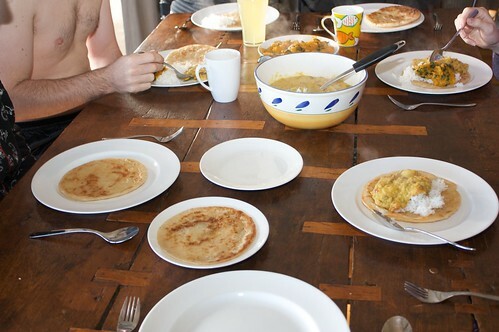 Months ago we hosted a curry party / curry potluck at our place, about which I never managed to blog. 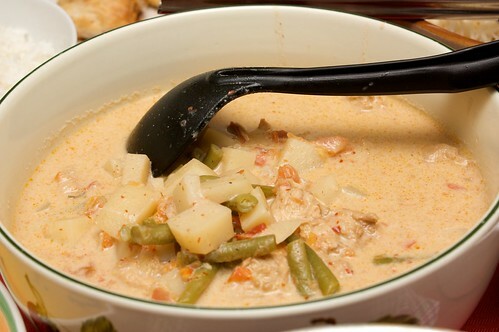 So now that I am very cold today, I am trying to warm myself up and I am thinking about curry! It was sweltering in our front room, eight of us crammed in mid-January, it was warm and we had to open all the windows and take breaks to go outside, where we were bitten by mozzies but we weren't so tightly packed. 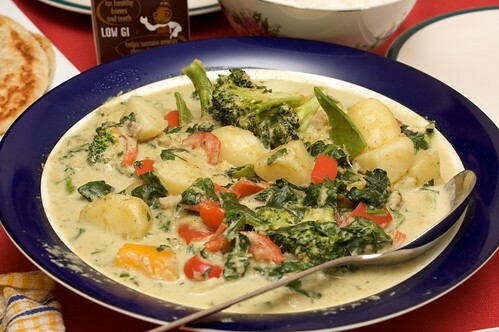 Everybody brought a random vegan curry, above is some sort of thai-ish green curry by Msh (please ignore the milk in the photo, someone thought they'd need it to combat spiciness). 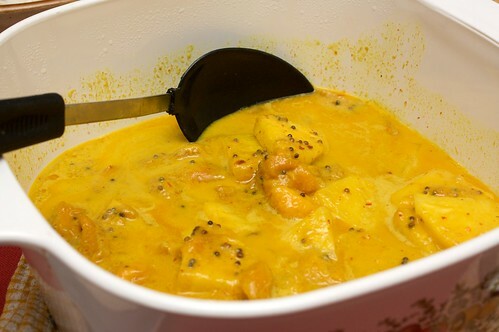 Matthias made a fragrant pineapple and mango curry, he loves sweet and spicy sorts of Carribean curries. 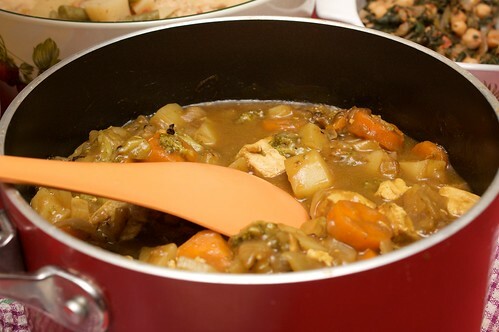 Stephen rocked in with this delicious, very hearty and thick Japanese-inspired curry, more like a stew but still really great. I provided some laksa and some kapitan, easy and familiar and delicious. I really want some curry now. Sometimes, you just can't be bothered spending more than ten minutes in the kitchen. Fry's has this great range of vegan products, schnitzels and burgers and things. They're individually wrapped, which makes me frown quite a lot, but as an occasional lazy treat I can deal with that. I've found them for sale in Woolworths, in the freezer section. D has never been a big fan of "meat in a lump," (how D grew up in a mostly English household, I'll never understand) so we had this in a bun, spread with avocado, hommous and some delicious fried mushrooms. We also served it with a great salad, brimming with deliciousness (ie, avocado, spinach, carrot and mushrooms) and punctuated by some orange. I love adding fruit to salad, I don't know what it is, but a little fruit really adds something great to salad. 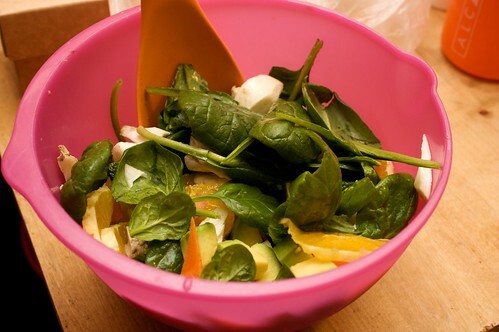 I also like adding plum or pear to salad (but it always has to be fresh, it can't be canned). 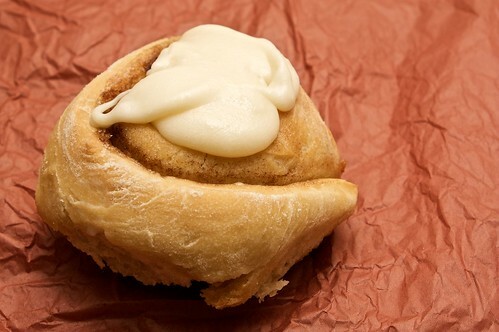 I'd like to talk about my love for apple danishes. They're delicious. 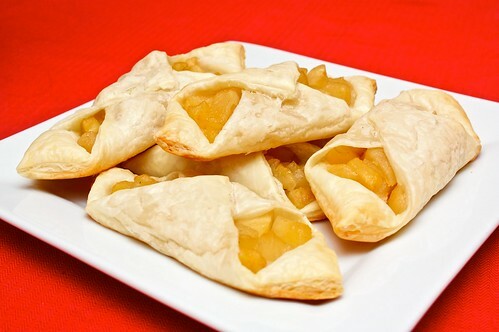 They're quick and easy, all you need is some puff pastry, some apples, and some cinnamon. They are a great, OMG WHAT ARE WE HAVING FOR DESSERT dessert, and I almost always have all the necessary ingredients available. 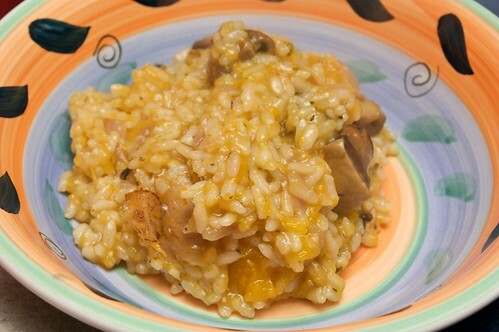 I've blogged a recipe before here, but it's pretty flexible. Last night I made apple danishes, but I made a few very delicious modifications, skipping the sugar and nutmeg in the mixture, and cutting the apple more roughly into thin slices rather than dicing. Last night I smoothed a dollop of the Sweet William chocolate spread into the centre, then a spoonful of the apple mix, then I folded, brushed and baked as usual. 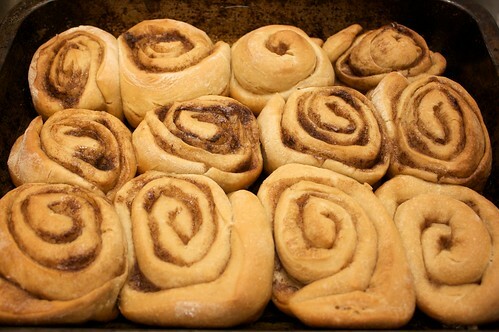 Baking time extended an extra five to seven minutes. That dollop of chocolate was amazing, careful of the molten chocolate when you're biting into it fresh from the oven! In a sudden wave of research on Thursday before we'd left for Eagle Bay, I'd discovered the existence of Samudra, a yoga and surf retreat in Dunsborough. Samudra has a real food philosophy, so I was very excited to give it a go, since we were going to be so close. 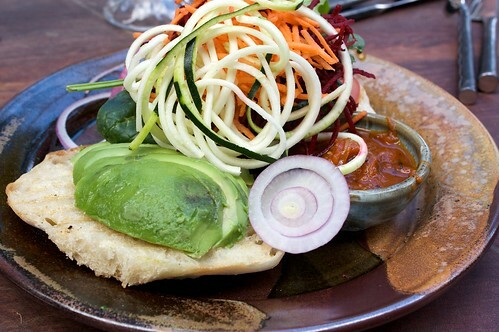 After perusing the menu, our friends wandered off to tackle the Dunsborough Bakehouse for meat-filled pies, and we settled in for some delicious somewhat-raw food. 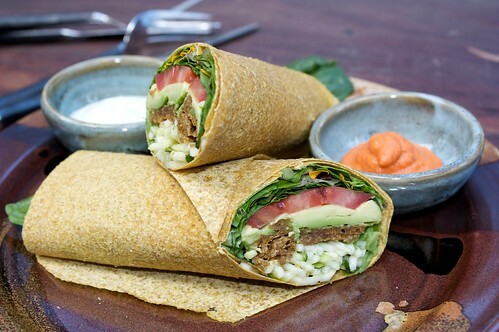 D ordered the Daily Sunwrap, the highlight of which was the delicious harissa. I ordered the lentil burger, featuring a delicious lentil and rice patty and some really great bread and avocado. Both of these were fantastic, though D complained that the sunwrap sat a little heavy for the rest of the afternoon. We also ordered some fresh juices. D's kiwi fruit and rockmelon juice was amazing, which D loved despite a dislike of rockmelon (it was supposed to be watermelon juice). I ordered the orange and ginger, but sadly whoever made it didn't understand the power of ginger, and it was the most gingery drink ever, and I was unable to finish it. Fortunately everyone tried it (when they returned from the bakehouse), and Greg was able to drink about half of it before the ginger overwhelmed. A shame, as it was a very expensive juice (at $8.00). Overall, a good meal, if a little on the expensive side. Went down South to Eagle Bay for the weekend, it was awesome. The plan for the weekend was to hang out with fabulous friends, play games, and eat a lot of food, and that is exactly what we did. We started our long weekend of noms on Thursday evening, with some pizza. Gilli made the pizza base in Perth, and it rose on the drive down. We ended up with four pizzas, two vegan and two not-vegan. 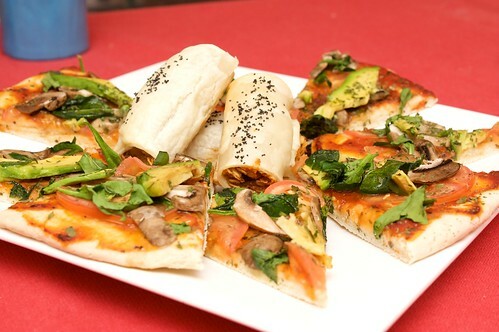 Our pizzas were delicious, I love a good home made pizza. 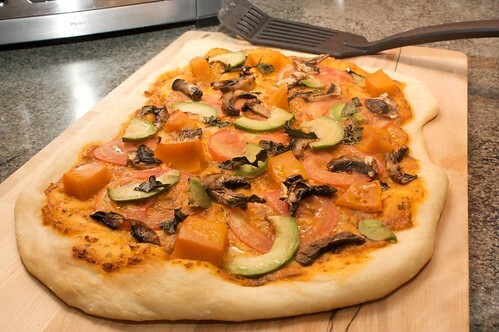 Gilli had made two different types of base, one herbed and one plain, and we covered them with awesome things like pumpkin, fresh basil, and avocado. We also had this amazing tomato and cashew pesto that Greg had picked up from a craft fair earlier this year, it was a little spicy and delicious on the pizza, and as a spread on bread! Friday’s breakfast was all vegan but for the ice-cream. 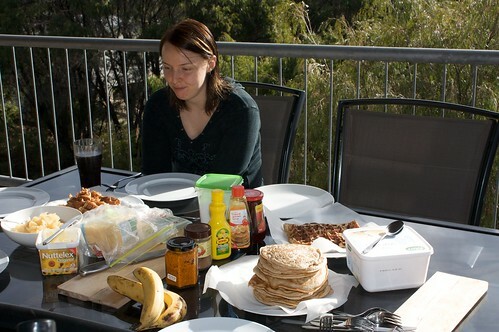 I made pancakes, and Kandace made waffles, and Gilli stewed some apples, which was awesome. We supplemented with banana, golden syrup, and nuttelex. The waffle mix was new, and wasn’t quite viscous enough to work properly in the waffle maker, but it was still awesome! At lunch we went to Samudra, a vegetarian restaurant in Dunsborough. Review to follow! (It was delicious) ETA review here. 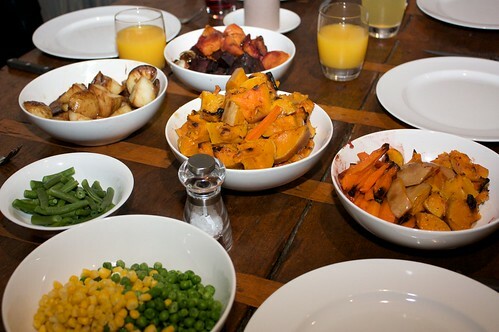 Friday dinner was a roasted extravaganza, featuring roast pumpkin, roast potato, roast sweet potato, roasted carrot, roast mushrooms and roasted beetroot. Roasted mushrooms are amazing. Amazing! They were field mushrooms, stems removed, sprinkled with oregano and parsley and some other herbs, and I am absolutely going to roast mushrooms from now on. It also included beans, peas, carrots, and one of those Sanitarium roast things. 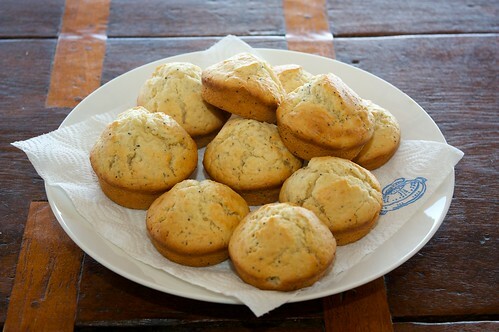 On Saturday morning Greg and I baked jam thumbprint cookies and lemon and poppy seed muffins. Of course, this delayed breakfast somewhat, but it was worth it. 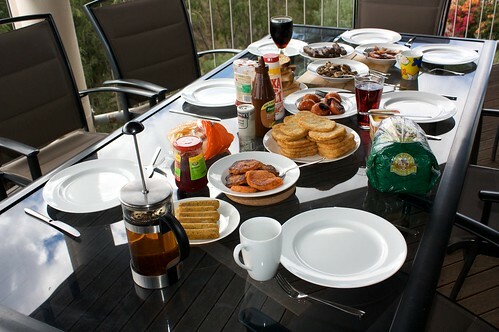 We finally started cooking a massive fry up for breakfast, including hashbrowns, sausages (vegan and not), toast, tomatoes, mushrooms, and sweet potato hash browns. There was also tea, and jam, and more of the awesome pesto, which featured heavily throughout the weekend. The sweet potato hash browns were an experiment, and it wasn’t until I started googling that I discovered ‘hash’ means so many different cooking related things! But we wanted hashbrowns, delicious fried flat goodness, and they were fantastic, crisp on the outside and soft on the inside. 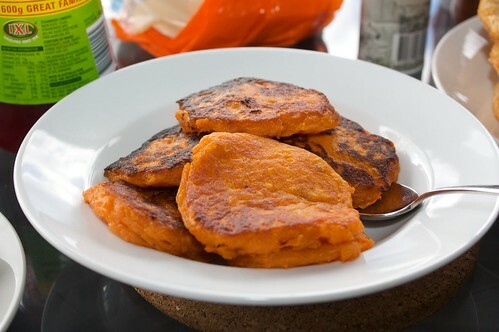 The recipe needs some tweaking, but in general we boiled the potato (peeled and diced) until it was soft but not super soft, then roughly mashed with five tablespoons of plain flour, combined them into cakes and fried them in the frypan for a few minutes. Incredibly delicious! 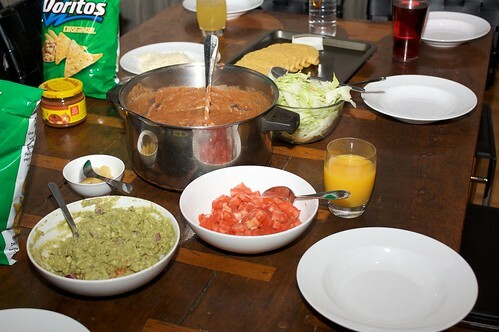 Saturday dinner was nachos and tacos, simple and fun. I like seeing what toppings people pick. In preparation for Sunday breakfast, late Saturday night I cooked a pumpkin saag and some dahl. The dahl was my usual recipe, which I know without looking and is so tasty, so my favourite. The saag was an attempt at the pumpkin saag from Veganomicon, but we’d left the recipe on the kitchen counter at home and so I worked from memory. I added a sliced chilli, seeds out, to give it some flavour, and forgot the cinnamon and whatever dried herbs go in it, and I added garlic and ginger. It was different, but still tasty. We served the curry with roti and rice. Before we left on Sunday afternoon, more baking was to be had, for the trip back to Perth, and I made a whole lot of sushi. An awesome weekend of noms. D and I were also very appreciative of our friends, not just for their awesomeness in general, but for their awesomeness in ensuring strict separation between vegan implements and non-vegan implements, to minimise cross-contamination. There's an interesting post at Vegans of Colour on how veganism may disconnect a vegan from their culture: Veganism and Cultures of Origin. In the first year or so, I felt very distanced from the sharing/togetherness of festivals. Getting used to fake-meat products as substitution has definitely helped decrease that distance, particularly as due to their original purpose (as substitute at religious festivals where no meat is eaten) they are tasty and easy to substitute, so often now at festivals we don't have "this is the meat version, this is the veggie version;" instead we have "here are all the dishes," and D and I get to share in the passing of food around the table, in the sharing and the complimenting and the fighting over the last piece. And we get to share in the superstition, the fish for abundance and the duck for prosperity and so on, and these are some of the most important elements of how we propagate our traditions. Being vegan now highlights and emphasises the difference - as mixed-race, particularly as someone who spent her formative years in Australia, I'm often considered not Chinese enough. 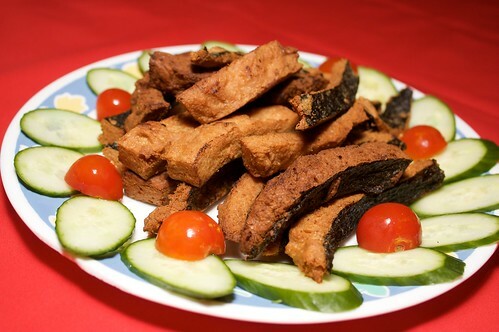 Now that I don't eat meat (and don't eat egg tarts), I'm frequently considered not-Chinese enough, and though I've spent years working hard to define my own identity, to be as Chinese and as Anglo and as Australian as I want to be, sometimes being told I'm 'completely westernised' by someone is incredibly demoralising. I've blogged before about how vegetarianism/veganism is often spoken of as an "ethnic" thing, Asian or African or something "exotic." You can be vegan or not, regardless of your ethnicity, regardless of your cultural background, but it's approached, particularly in Western media and blogging circles, as something that only "ethnic" food lends itself to (and oh, how I hate that word in this context). So it was particularly galling to read an article that was both homophobic as well as othering to the food I grew up with as Chinese, and that I eat a lot of now as vegan, the article is Soy is making kids 'gay.' It's hardly from a reputable source, but galling and othering all the same. It's like everywhere I turn, as a Chinese vegan, there is an opportunity for me to be categorised as other. 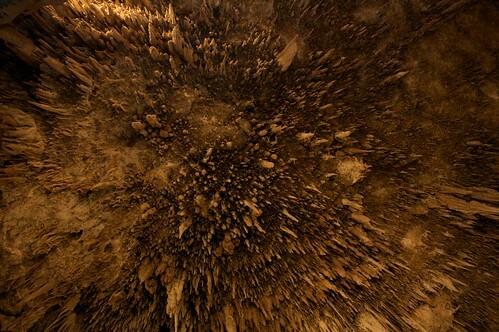 It's not as awesome as you might think. D and I went down south for the weekend with some friends, and there will be a post of awesome noms to follow, but I wanted to quickly blog about these great buns D made last weekend. D used our usual pizza base recipe, leaving the bread to its first rise, then kneading, dividing into seven little rounds of bread, and leaving to rise a second time, before transferring to the oven for baking. Yum! 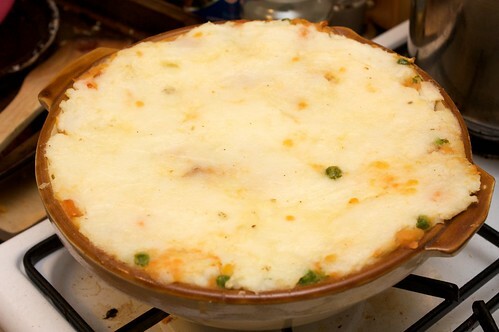 D's Nan makes this really delicious lentil pie, which I've blogged about previously after she provided it at Christmas. Then she wrote up the recipe so I could try it at home (though deciphering whilst trying to cook was a bit difficult). It is very delicious, and great in this cooling weather - in Perth at least it's 'is it winter? is it not?' weather, and that's okay for beautiful warm ovens filled with delicious warm pies. 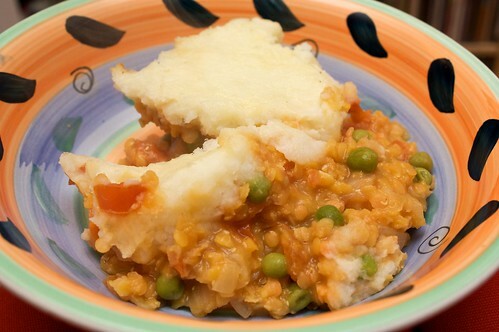 Soak lentils in hot water, cook and mash potatoes (with a little bit of milk or nuttelex). In a little oil, fry the onions, then as they soften add the garlic. Add tomatoes, as well as tomato paste, drained lentils and carrot. Fry for a few minutes, then add stock and bring to a boil, then reduce heat and simmer uncovered for 25 minutes, stirring occasionally. Combine soy sauce, oyster sauce, and one tablespoon of vege stock. Add combined sauce and peas to the pot and cook for a further five minutes. Spoon mix into a large dish, and cover with mashed potatoes, and brush with nuttelex. Bake uncovered at about 200C for 20 minutes. Leave to stand for five minutes before serving. Leda makes these great gf fake tim-tams and mint slices. They're not identical, but they're better than nothing. I've blogged about them before! 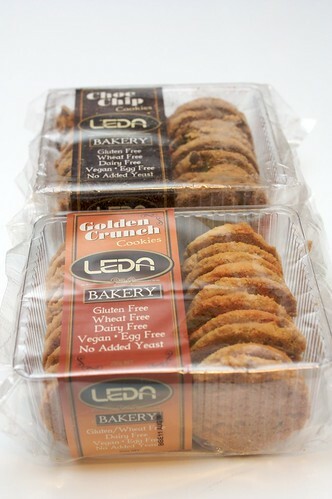 D was out and about recently and found that Leda has started producing more varieties of biscuit. These biscuits are okay, but not brilliant. 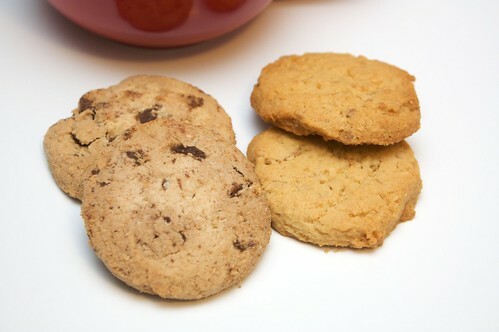 Both the Golden Crunch and the Choc Chip are quite dry and flaky, and the Choc Chip leaves a funny aftertaste, I do wonder if it's due to the choc chips in the biscuit. It's nice to have a choc chip biscuit we can now buy in a shop, but my home made ones are far tastier, so I'll probably stick to just making them. These are about $5 a pack. D found them at Coles in Claremont Quarter. Back in March, we attended a wedding dinner at the Hilton and had a very delicious sweet potato filo parcel, which we long thought about replicating. I put it off and put it off, and I got home from class one night and there were these delicious parcels, waiting for me! Peel and dice the pumpkin and sweet potato, removing the pumpkin seeds. Boil, with the rosemary and basil, until soft, and then mash, mixing in the cumin. 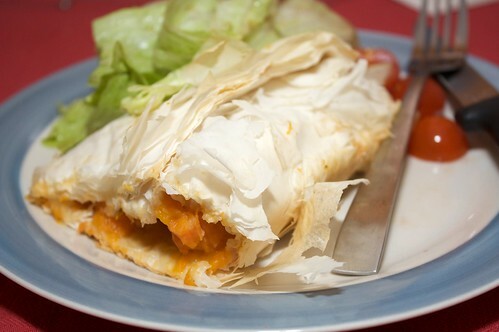 Cut the length of filo in half, across the long edge, and brush (with milk or oil) and layer into two piles of pastry. Divide the sweet potato/pumpkin mixture evenly between the piles, and wrap. Brush each parcel with oil or milk, and bake in the oven at 180C for about 30 minutes, or until golden. 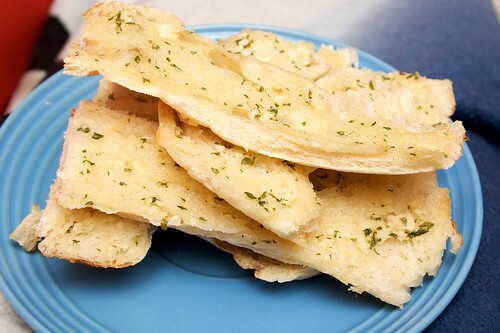 Goes great with a salad or something. Due to uni, rotations and various other commitments, although it was Dr A's birthday two weeks ago, we only just got around to celebrating with him yesterday. This is a necessary part of any birthday party. 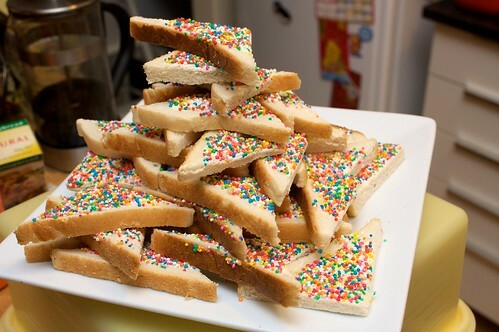 At work people mock me for providing fairy bread, but it is always the first plate of food to be finished! Because it is basically sugar and whitebread, zero nutritional value but filled with deliciousness! I made the sausage roll mix the previous afternoon, and in the morning thawed the puff pastry and rolled the rolls. As previously, the sausage roll mix was from a recipe by vegetation, very slightly modified. Pizza base was made by D in the morning and left to rise for a little bit. The food was rounded out by the almond cake from My Sweet Vegan. 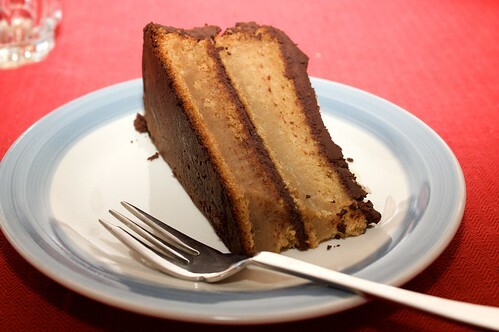 The cake was okay, very goopy when making it and very heavy when eating it, and I didn't enjoy the ganache at all. So although everyone else seemed to like it (UNLESS THEY WERE LYING), I'm not sure this one will be a repeat.